You just recently picked up your vegetable seeds (or have received your Seeds of the Month Club seeds) that you are going to plant in your upcoming vegetable garden. You are fairly new to vegetable gardening, but wanted to give growing fresh veggies from seeds a go. You have a number of reasons as to why you would like to grow directly from vegetable seeds dancing through your head ranging from the challenge of growing from vegetable seeds up through, quite frankly, growing veggies directly from seeds is simply fun. You turn over your vegetable seed packet to see what you have to do to your vegetable seeds to ensure you are successful at growing them, and what you see is a lot of vegetable gardening information, that you simply find confusing. What does it mean to space out your vegetable seeds? What is vegetable seed spacing between rows? And what does it mean, Days until the vegetable seeds are mature? For many, the information on your vegetable seeds pack can be a little confusing. Hopefully, I can clarify a little of that vegetable seed information for you. Your planting depth, tells you exactly how deep or shallow your vegetable seeds should be planted. In our example packet of vegetable seeds, you see that your planting depth is a quarter to a half inch. That means your vegetable seeds should be planted no deeper than a half inch and no shallower than a quarter inch. This ensures that there is not too much soil op top of your vegetable seeds and just enough soil for your vegetable’s roots to take hold. Once again using the example vegetable seed packet, you can see that the recommended vegetable seed spacing is two inches. When you initially plant your vegetable seeds make sure they are spaced out at the distance written on the vegetable seed packet. With smaller vegetable seeds, such as celery, it is nearly impossible to properly space out your vegetable seeds when initially planting them. In this case, plant plenty of those vegetable seeds and then when they sprout, use a pair of scissors and thin them out to the recommendation on the vegetable seeds packet. This piece of data lets you know how long it should take for your vegetable seeds to germinate. The information provided is the best case scenario (on the example vegetable seed packet that number would be five) up through the worst case scenario (on the example vegetable seed packet that number would be fourteen). The best case for your vegetable seeds would occur under optimal conditions, i.e., plenty of sun, regular watering, optimal temperatures, and ideal nutritional source for the vegetable seeds such as fertilizer or compost etc. Chances are your vegetable seeds will germinate closer to the middle of that range, although many have great success for their vegetable seeds closer to the optimal day. When you initially plant your vegetable seeds as per the Seed Spacing recommendations discussed earlier, you would not leave your sprouted vegetable seeds at that distance. Your vegetable seeds simply would not grow well. What you have to do now is space your sprouted vegetable seeds out a bit further to give the vegetable plants’ roots (as well as the vegetable plant) plenty of room to grow. On the example vegetable seeds packet we see twelve to eighteen inches as the ideal range to space out your vegetable plants once they sprout, with twelve being the minimum. The more you space your vegetable plants out, the better chance they will have to grow large and in the case of tomatoes, peppers etc., they may even produce more fruit. The days to maturity value on the back of your vegetable seeds packet is the recommended time frame as to when you can expect to harvest the vegetables you are growing. In the vegetable seed packet example provided, the days to maturity for Kale is fifty-five to seventy days. So, somewhere within that time frame your vegetables should be harvested. Conditions will also dictate this time frame as well, such as drought, heavy rains, and cold weather and so on. The days to maturity time frame on the back of your vegetable seeds packet is also a great gauge to use when your growing seasons are short. It will help you calculate exactly when to start your seeds indoors. All you need is the date of the last frost in your area (provided by the USDA frost zone map), days to germination (on your vegetable seed packet) and the days to maturity (on your vegetable seed packet) and you can calculate when you should start your vegetable seeds indoors. You will never see this data on any vegetable seed packet, however, I wanted to bring it up, because it is very important for many who grow vegetable plants in pots or in raised bed vegetable gardens on patios. This is how deep your soil bed should be for your vegetable seeds. It is not written on the vegetable seed packets because of the room constraints of the vegetable seed packet itself, as well as assumption that they, the vegetable seeds, will be planted in a “regular” garden. Although, as you will come to find out, a regular vegetable garden is whatever you make it. As for depth, you want at least sixteen inches deep of soil as well as the recommended thinning space, to give the roots plenty of room to expand. The more room the better. On one final note. You will see a copyright date on your vegetable seed packet. In this example you see “Copyright © 2012”. This is the copyright of the information on the vegetable seed packet itself, this date has absolutely nothing to do with the vegetable seeds inside the vegetable seed packet. 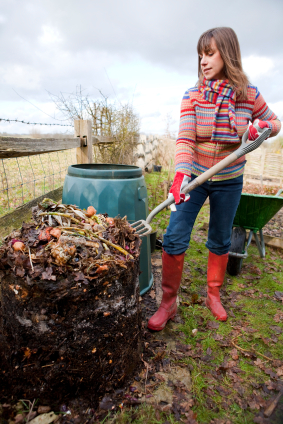 By now you already know that composting is a great way to add nutrients back into your soil. Remember your vegetable plants are going to deplete your soil of its nutrients every year and if you are not adding nutrients back into your soil, eventually your plants will produce far less than what you are used to. Composting gives you the ability to tackle this issue. Today, we are going to talk about sheet composting. Sheet composting is a specific composting technique, in which anyone can do, requires a little bit of effort and has wonderful affects on your soil. If you are someone that lives on a property where having a compost pile is virtually impossible, then sheet composting may be the way for you to go. As the name, sheet composting, implies, sheet composting is the process of layering (think in sheets) organic material on top of your garden bed and then mixing or tilling that organic material into your garden soil. Sheet composting works like this. First you cover your garden bed with a layer of leaves (or other organic material). Second, using a garden tiller or pitchfork, work that layer into your garden soil. As a side note the leaves (or any of your organic matter) will breakdown much faster if it is already shredded. While “pre” shredding is not mandatory for sheet or other types of composting, it will speed the process along. Finally, repeat the first two sheet composting steps using a different material. For example, if you used, leaves for your sheet composting the first time, use grass clippings for your second sheet composting layer. Second, sheet composting should be conducted in the fall to ensure that there is enough time for the organic material to break down prior to the spring planting season. So how much material should you layer in your sheet composting? This number will vary depending which source you get it from, but what I am finding is the average sheet composting layering amount should be anywhere from two to four inches of material, then tilling it into your soil. 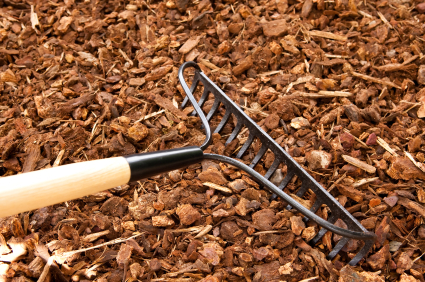 If you are going to conduct sheet composting in garden beds that have bulbs, such as flower beds, it is best that you do not use a power tiller. Mixing in your material for your sheet composting in these garden beds would best be done by hand, with a small trowel, garden weasel etc. Your vegetable seeds come in all shapes and size. Just as many sizes and shapes your vegetables come in is as many ways and methods to germinate your vegetable seeds. One way to start your vegetable seeds that I addressed in a previous vegetable seed starting video is to use vegetable seed starting peat pellets. These are expandable pods that you add hot water to and they expand so you can plant your vegetable seeds in them. Here is a link to that vegetable seed starting video. The vegetable seed starting (creative) pots I wanted to talk about today, were a couple of things I have done myself with good success. The best part of these two vegetable seed starting pot options is that they are made from a couple of household items that you already have in your home. Of course, as we all know, regardless of what you use as a vegetable seed starting pot, your vegetable seeds do not stand much of a chance, if you do not give your vegetable seeds a great seed starting soil. You can either buy vegetable seed starting soil, or make your own vegetable seed starting soil with a mix of compost, peat and perlite in equal parts. Now that you have your vegetable seed starting soil, let’s begin with talking about our first home made vegetable seed starting pot, and that is using empty cardboard toilet paper rolls. Cardboard toilet paper rolls are great to use. 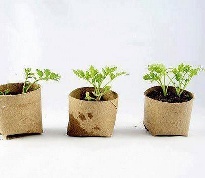 Cardboard toilet paper rolls are biodegradable, which makes them perfect for starting your vegetable seeds in because as the seeds germinate and the plants grow, the roots will want to expand. If the cardboard toilet paper roll did not break down, the roots would have nowhere to grow. I don’t believe in reinventing the wheel, and in this case, retelling the same vegetable seed starter story, so I had to link to it since YouGrowGirl.com does a nice job explaining the process of turning your cardboard toilet paper rolls into vegetable seed starters. The second crafty vegetable seed starting pot you can use is turning in those cardboard egg cartons into vegetable seed starters. Cardboard egg cartons work great because they are plentiful, making vegetable seed planting and space saving a great combination, and just like with the cardboard toilet paper roll, they will breakdown when you plant them into your garden. Sure neither of these homemade vegetable seed starting pots is earth shattering news, but if you are looking for some projects to do with the kids, or needed a good use for all of those cardboard ‘extras”, these are two more ideas in your arsenal. Parsnips are a great addition to many recipes. Once cooked, parsnips have a sweeter flavor then their close cousin, the carrot. Parsnips also are at their best flavor when harvested after the first frost. While you can eat parsnips raw, they taste much better once they are cooked. Parsnips are most commonly used in soups, stews and casseroles, although you are only limited with your use of your home grown parsnips from what you can imagine. Parsnip seeds take longer to germinate than most other root crops, as much as fourteen days. Even though you can start parsnip seeds indoors, it really does not make much sense to do so, since you can start parsnip seeds outdoors after the last frost and grow your parsnips straight through after the first frost in the autumn months. Parsnip seeds are larger than carrot seeds, making planting and spacing of parsnip seeds much easier to do. And because parsnip seeds are larger you can plant them a half inch deep. When planting your parsnip seeds make sure you space them out every four to six inches. You can also plant three to four parsnip seeds to a location and when the parsnips are three to five inches, you can thin your parsnips out every six inches or so. 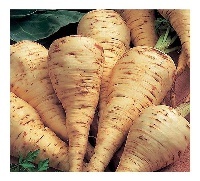 As mentioned earlier, allow your parsnips to grow straight through the spring, summer and autumn months. Once you have had your first frost of the season, your parsnips will be at their best flavor and ready to be harvested. To harvest your parsnips, simply use a trowel to loosen the soil around them, making them easier to pull from the ground. Parsnips store well in the fridge. After you harvest your parsnips, be sure to clean and dry them and store them in a Ziploc storage bag. Your parsnips will store for three to six months and even longer. Don’t forget to look up some recipes for your parsnip greens also. While your parsnips are growing make sure they receive an even watering, and choose a location that receives full sun (although they tolerate light shade). Parsnips make for great companion plantings to bush beans, garlic, onions, peas, peppers, potatoes and radish. However, keep your parsnips away from caraway, carrots and celery. I love to grow basil. The Italian Large Leaf variety of basil to be exact. This variety of basil has such a nice aroma to it, you can almost smell the mozzarella cheese, home grown tomatoes and olive oil you can add to your basil for a nice summer dish. Just as good as the smell of fresh basil, is how easy basil is to grow at home. Basil is one of those plants that can be grown in your backyard vegetable garden or in pots, if limited space is an issue. Either way, your basil will grow fine. The downfall of basil (as if basil really had any), is that basil loves heat. Even the slightest cooler temperatures (under 50 degrees Fahrenheit), may make your basil fall over and begin to wilt. The upside of your basil, because basil loves heat, your basil will do very well in the summertime. With your basil’s quick to maturity growing capabilities, you can be enjoying fresh basil in just a few weeks. Basil seeds are fairly small and while you can plant your basil seeds up to a quarter of an inch deep, all you really need to do is lightly cover your basil seeds with some soil. If you are going to start your basil seeds indoors, just make sure your basil seeds, when planted, are placed in a warm location and receive at least 5 hours of sunlight daily. If you decide to sow your basil seeds directly outdoors, you want to make sure that temperatures remain above 50 degrees, or otherwise cover your basil with a cloche, row cover etc. The Italian Large Leaf variety basil, when given the room, will grow very large. So make sure you space out your basil at least eight inches. Your basil will use up that space. Regardless of which variety of basil you decide to go with (there are plenty to choose from), most varieties of basil love full sun and require a light, but even watering. As a side note, basil is a great companion plant for tomatoes. A lot of people like to “warm” up their garden beds for their basil. This can easily be accomplished by laying a clear .6 mil. thick plastic tarp over top of your garden beds and letting the sun do the work for you. This process will create a nice warm area for your basil. Expect your basil seeds to germinate in as little as 5 days, although 10 days is more likely. One of the beauties of basil is that you do not need to harvest the entire plant. You can simply snip off basil leaves with a pair of scissors and use it when you need it, leaving the basil in the ground to continually grow. The real hard part is finding recipes for all that home grown basil you are about to grow. There is a lot of talk these days about gold and precious metals, but for the home vegetable gardener, nothing is more “gold” than compost. Compost is the ultimate source for everything your plants need to grow and produce. Compost is more than likely the answer to any vegetable gardener’s question on soil improvement. How do I enrich my soil? Compost! How do I make my soil more friable? Compost! How do I make my soil better for water retention capabilities? Compost! Yes compost is really the answer to a lot of vegetable gardening questions. If you think compost is too good to be true, then all you need to do is go ask any fellow vegetable gardener that has been growing their own veggies for some time and they will be the first to tell you that compost is the answer. So what is compost? Where do you get compost? Is compost safe to use? Compost is nothing more than taking organic material and letting that material breakdown naturally. Such material would include, grass clippings, leaves, wood ash, your leftover dinner, coffee grounds, tea bags and so much more. It would not include, aluminum cans, plastic containers and so on. That stuff is called garbage, but you probably know that already. As you can see from this basic list of materials you can make your own compost from the items that you already have in and around your house. Forgo the garbage disposal and start composting (which is the act of creating and making compost). I will get to more on composting in a second. So is compost safe to use? The answer is absolutely! In fact I truly believe you would be missing out on a successful garden without compost. Compost, as stated before, enriches the soil by adding nutrients, and compost has even shown in some studies to help your vegetable plants fight off disease and insects. Composting, the act of actually creating compost, is easy. The two easiest methods of composting, at least to me anyway, is a compost pile or trench composting. A compost pile is as it sounds, a pile of the organic material mentioned earlier. You would take an area of your yard, property etc, and simply make a pile. Over time this pile would break down into healthy usable compost. Of course if you live in a suburb development, town home area and so on, a compost pile may look unsightly to “non” vegetable gardeners. So you can either convince your neighbor’s to get on board with what you are doing (the harder path), or simply enclose your compost pile, to make the pile look “neater”. The second composting method is trench composting. This is where you will immediately bury your organic material about 18 to 24 inches into your garden. The downfall of this composting method is that you cannot, actually I should say, you should not bury anything while your vegetable plants occupy your garden area. You don’t want to disturb your plants’ roots. In the end you will have to keep a compost pile anyway. Compost is free! Ok, compost is virtually free. You still have to add the material to a pile to make it. Start your own compost pile today!